[By Nick] National Ice Cream Month might have ended yesterday but don't worry, we like to celebrate all year long. Let's take a look at a Coolhaus sandwich I got from the Niskayuna Co-op. This is a pretty sandwich. Heck, all Coolhaus sandwiches are pretty. For something mass-produced, the quality is unmatched. Thick yet soft cookies with a good helping of ice cream is always a beautiful thing. The Dirty Mint Ice Cream is also available in pints but it's not in my area that I know of. It might be a good thing for me though. The mint is very fresh on its own. The chocolate chips in it don't add much from what I can tell. While it's not super grassy, it is a stronger fresh mint flavor than I'm fond of. Still the quality and commitment to excellent ingredients is prevalent in the ice cream. The cookies though save this for me. They're exactly like the cookies I encountered straight from the truck, albeit a bit smaller. Still, they are fresh and chewy with no signs of ever being frozen. 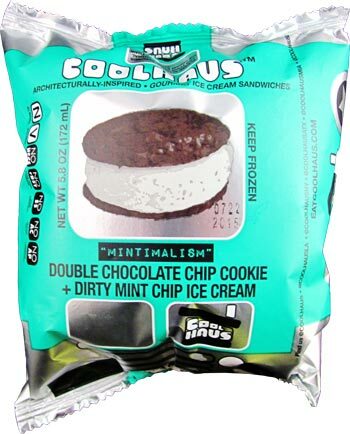 This is just some sort of next level ice cream sandwich technology going on at Coolhaus. I will never understand how these cookies stay so fresh and delicious. The cookies add a very strong, sweet yet bitter note to the sandwich which is much needed. It helps tame the fresh qualities of the mint and makes this an enjoyable novelty. I'm very curious as to what my thoughts would be with a pint of this ice cream though. 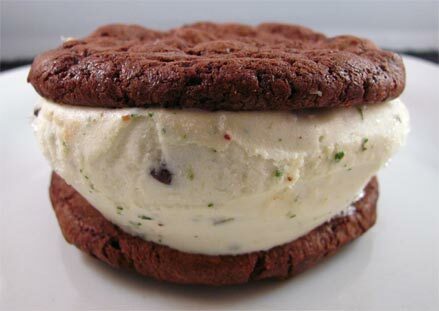 The cookies make this sandwich and from what I sampled of the ice cream, I was not much of a fan. Until I can find that pint, this sandwich is definitely one of the better mint novelties on the market. 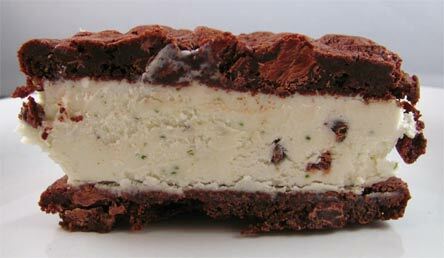 This is my favorite ice cream sandwich. It's a must try! Got a chance to try a few of the coolhaus a month or so ago. The Balsamic fig, salted caramel, and mint were my 3. Of the 3 the mint was my least fav. I thought it was a nice summer ice cream. It def had a fresher almost spearamint flavor to me. Id eat it if it was around but I wouldn't choose it again. However my wife and I fought over the Balsamic fig. This sort of looks like pistachio ice cream. What's your verdict on that flavor? I had a pint of the Dirty Mint. It's, umm, interesting. Sadly, my local Fresh Market must have had a freezer failure at some point because mine was crystallized and gummy on top. Spooning that into the sink, I only got a few spoonfuls in before being a bit overwhelmed by the fresh mint flavor. Now....I'm someone who doesn't mind chewing on a mint leaf....this was a bit more earthy than that. You have to try it to understand what I mean. I'm not sure I'll buy it again but left the rest for my 9yo to try as she's really into mint lately. We'll see what her take on it is.